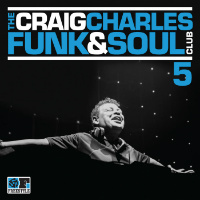 The Craig Charles Funk & Soul Club compilation series has been bowling along for half a decade now and as Vol. 5 hoves into view you realise that it is showing all the signs of having a similar longevity and appeal of, say, TV series Red Dwarf. No wonder the front cover shows our man soaking up the adoration at one of his club nights. Talking of the club nights, which can vary musically from funky soul to disco heaven as the mood taketh Mr Charles, you’ll no doubt be wondering what sort of vibe is created for this installment of the series. The answer, as ever, (within the confines of funk and soul) is that anything goes. There’s a bit of the old for example, in the form of jazzy afrobeat cut Nawa by afrobeat pioneers Ginger Johnson & His African Messengers and the groovy smoothness of Inner City Blues by Bryan Auger’s Oblivion Express. There’s also plenty of the new – another seventeen tracks to be precise. Sticking with the smoother side of things, it doesn’t get much more mirrorball slick than Niteshifters Show Me What You Got or Kylie Auldist’s Body which nails the 80s boogie sound every bit as effectively as anything on last year’s Family Tree LP. If you want total peak set total crowd pleasers, you’d be pushed to find anything bigger than the instro cover of Rick James’ Super Freak by The Traffic whose line-up includes Ivan Khtachoyan of Cookin’ On 3 Burners. Two of the biggest names featured are the sadly departed ‘Screaming Eagle of Soul’ Charles Bradley, whose Change For The World from last year’s Changes album makes an appearance and Carleen Anderson whose contribution is Begin Again from last year’s Cage Street Memorial. The best cuts however come from The Allergies with their Indeep-ish Andy Cooper-featuring Love That I’m In from their Push On album, Lack Of Afro’s Wax & Herbal T-featuring Back In Business and a brace of little-known bangers. The first of these is Daytoner’s Funky Drummer-beat driven sister soul groove I Get By (I Got The) and arguably the LP’s secret highlight – the vintage surf-meets-northern soul of The Hawkmen’s Love Is Blind. And while love might be blind you’re not deaf are you. You know what to do. Jazz Remix Chart trip hop Fort Knox Recordings vinyl 7" Basement Freaks Badboe Record Kicks Electro swing BBP glitch-hop Mr Bristow vinyl Fort Knox Five review Ewan Hoozami Jalapeno Records latin Bulabeats nufunk The Allergies disco Free download breaks video Tramp Records Funk Breakbeat Paradise Renegades Of Jazz psych Smoove Rory Hoy Soul hip-hop reggae ghetto funk Dirty Dubsters Morlack 7"